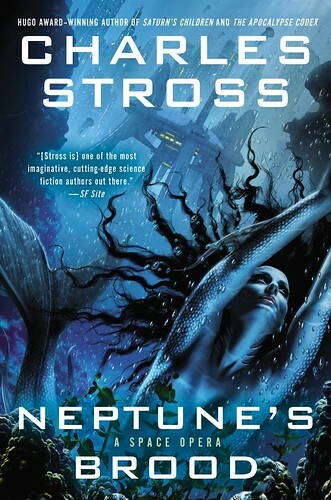 This is a review of Charlie Stross’s science fiction novel, ‘Neptune’s Brood‘. It’s a sequel of sorts to another book of his that I reviewed a couple of weeks ago, ‘Saturn’s Children’. Both of these books envisage a post-human robotic civilization. (In both books, the robots have very human like personas, having been modeled after their creators.) Neptune’s Brood takes place several millennia after Saturn’s Children, with different characters, and in an interstellar setting, although all of the action takes place in a single star system. In this universe, physical interstellar travel remains much slower than light speed, requires centuries to reach a destination, and requires extensive funding to happen. However, all of the characters are post-human machines with digital souls, which enable them to travel between established star systems by transmission. Once an interstellar colony is established, it builds a beacon station, putting it in communication with other solar systems, and individuals can transmit in or out at the speed of light, within a matter of years instead of the centuries required for physical travel. At the time of the story, natural humans have gone extinct and been recovered several times. Humans are referred to as “fragiles” due to their fragile nature, with their stringent biosphere requirements and tendency to quickly die off when any part of those requirements aren’t met. A religion has developed, the “Church of the Fragile”, dedicated to nurturing humans and colonizing the various solar systems with them. While the attitude of most of the post-human population in the book toward this religion and its efforts appear to be sympathetic, the events in the story make it apparent that those efforts rarely succeed. The main character is Krina Alizond-114, an accountant and banker. She is one of several daughters/copies/offspring of a harsh matron named Sonda Alizond-1. At the beginning of the story, Krina has transmitted into Taj Beacon, the communication station on the outskirts of the Dojima System, been instantiated in a body, and is looking to book passage to Shin-Tethys, a water world in the inner part of system. She ends up finding a berth on a chapel ship of the Church of the Fragile. On Shin-Tethys, she is hoping to meet up with her sister, Ana. However, Ana has gone missing. Much of what is happening in the beginning of the book is mysterious, including what Krina’s actual mission is, why her sister Ana has gone missing, and who all the players are. As in ‘Saturn’s Children’, Stross manages to work in a number of interesting concepts. Most of the spaceships are powered by continuous low thrust drives, with acceleration measured in milligees, and interplanetary travel times consequently in the hundreds of days. Descent into and ascent out of a deep gravity well, such as a planet, remains an expensive and inconvenient process. The characters end up descending to a planetary surface in a capsule, and later launch again in the same capsule on a booster rocket stage which separates once they’re in orbit. Interstellar ships, in the early years of their journey, are described as being powered by a laser beam from their originating solar system, gradually accelerating to around 1% of light speed, then coasting toward their destination, and then using their stored fuel for deceleration in the final years. Stross spends some time describing Shin-Tethys, the water world. Apparently inspired by the exoplanet descriptions that have emerged in recent years, Shin-Tethys is completely covered in an ocean that is hundreds of kilometers deep. It is described as having several different political states, with some states existing at or within a few hundred meters of the surface, and other states existing in lower layers, with the deepest communities lying very low in the dark high pressure depths. In this post-human civilization, characters are able to have their bodies modified to function better in various environments, and many of the citizens of Shin-Tethys are modified for their environment, with gills, fins, and other adaptations to survive in an aquatic environment. But the most interesting concept that Stross explores is interstellar finance. He describes a concept called “slow money”, used to process transactions between solar systems. He goes into some detail describing it, which is unfortunately too involved to describe in a blog post. In the narrative, Stross becomes somewhat philosophical about what exactly money is, and its role in society. The interstellar financing mechanism ends up being very important to the plot of the book, but in a way that is difficult to describe without getting into spoilers. What I can say is that Stross does a good job of describing a durable financial system, yet with flaws that some of the characters are able to exploit. There is plenty of action in the book, including space battles, malevolent assassins, corrupt rulers, mermaids, plot twists, and all the hallmarks of an fun adventure. As in most of his books, Stross is never far from satire. Many of the situations in the book, such as an attack by space pirates, are blatantly absurd, but in a way that works for the overall story. As I mentioned in my last review, Stross’s strengths aren’t really in character development, but in the exploration of scientific, technological, and societal concepts. If that type of work appeals to you, then I can enthusiastically recommend ‘Neptune’s Brood’. This entry was posted in Science Fiction and tagged Book, Charles Stross, Hard science fiction, Neptune's Brood, Saturn's CHildren, Science fiction. Bookmark the permalink. No, they’re separate enough that I think you could read Neptune’s Brood without any problems. Saturn’s Children might give you a little insight into what’s happening with the Church of the Fragile, but nothing crucial for the overall story. Excellent review and it has certainly got me very interested in delving further and reading both of the books. Once again, thanks for any entertaining post!